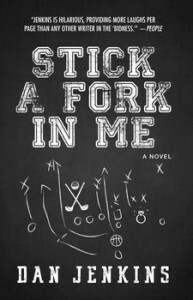 If you’re in a funk, then go out and buy Dan Jenkins latest novel, “Stick a Fork in Me.” It’s a romp and will deliver a tonic of laughs and amusement. This is the legendary sportswriter’s 21st book and his 11th comic novel. At 88 years of age, Jenkins ably demonstrates he’s hitting it long and straight and not moving up to the senior gold tees. With his wicked wit and laugh-out-loud lines, he’s still reaching the par-fives in two. But such compliments are not Wallace’s (or Jenkins’) stock in trade. Far better to expose hypocrisy, greed, and folly with satire and caricature. Suffice it to say, big-time college sports and society in general allow for plenty of scoring opportunities. In Jenkins’ deft hands, “Stick a Fork in Me” is a winner. Stick a Fork in Me is published by Tyrus Books and available via Amazon.